The Highways England A14 Cambridge to Huntingdon improvement scheme is underway. Applications to the A14 Community Fund are invited by constituted not for profit groups (not individuals) delivering charitable projects with public benefit. Groups may be registered charities, Charitable Incorporated Organisations, Community Interest Companies, Schools, Social Enterprises, Parish Councils or small voluntary and community organisations. Groups need to be "grant ready" which means having appropriate policies and procedures in place to ensure their good governance and accountability. In addition to the list of requirements set out on this website (click here for grant ready definition), groups applying to the A14 Community Fund are required to submit their Health and Safety Policy at the full application stage. 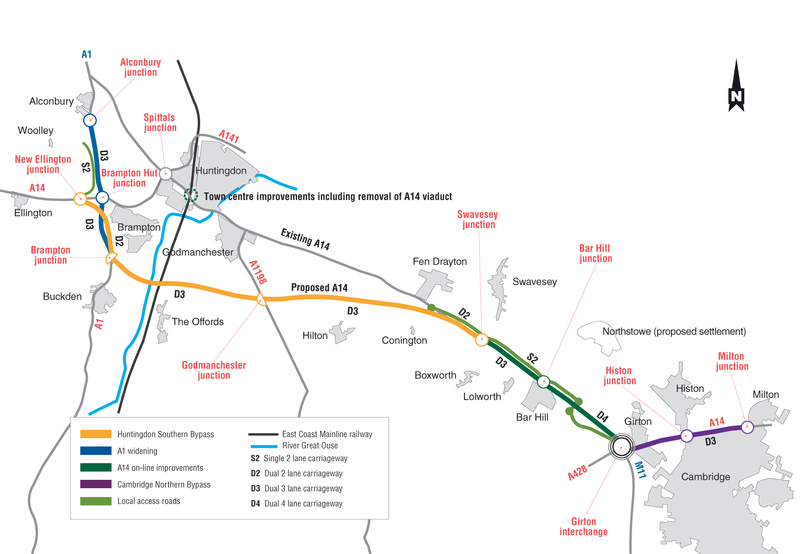 As well as working within one of the themes for the Fund, projects must be able to define the link they have to the development work on the A14. The link MUST NOT ONLY BE a close geographical link rather projects must describe the way the project is a response to the development. Grants offered will normally be up to £10,000 to cover revenue and/or capital costs, although in exceptional circumstances higher sums may be considered. Projects will need to show they have given appropriate consideration, and taken necessary steps, to secure funding from other sources to contribute as a match to the project. Although projects will be looked at on a case by case basis, as a rule of thumb it is expected that 10-20% of the funding required for the project has been secured from other sources. Funding will not be given to support activity that is considered to be a statutory responsibly (even if there are no statutory funds available) nor will awards be made to cover costs already incurred or committed. In addition, rather than fund individual speedwatch/traffic calming measures requests, the A14 Community Fund has supported the purchase of speedwatch equipment as a central resource. Parishes that wish to use the equipment should contact CCF to find out the details. The Farming and Wildlife Advisory Group (FWAG) East received £10,350 to establish a cluster of 20 farmers who have been affected by the A14 improvements to share ideas and run environmental projects. Huntingdonshire History Festival received £9,107 to run a festival promoting the history of Huntingdon through the theme of the development of the A14, including interactive displays, talks and competitions. Cambridge Curiosity and Imagination received £9,928 to run a number of art workshops and community events enabling local people to engage with protecting wildlife along the A14. Living Sport received £10,000 to help villages in rural locations to set up their own walking, running or cycling programmes involving local volunteers. Peterborough Environment City Trust received £9,927 to provide training and resources for schools in Huntingdonshire to enable them to incorporate the themes of Wildlife, Sustainable Food and Sustainable Transport in lessons. Applications for grants for this fund follow a two stage process. For Stage One, please complete the Expression of Interest Form and return by email to info@cambscf.org.uk. Selected Expressions of Interest will be invited to Stage Two, where applicants are asked to complete an online form and send supporting documents.